You are here: Home / Sailing Boats / Islander 17, Trailer Sailor, At Coniston Boating Centre. Islander 17, Trailer Sailor, At Coniston Boating Centre. for family leisure sailing, a very forgiving and stable boat. possible to renew the berth subject to agreement with the boating centre. Included in the storage fees they launch and retrieve it for you. paddle; 12v bilge pump; all the rigging and fittings needed and 2 good sails. rigging and mast were replaced 4 years ago at a cost of £1400. ask as many questions as you wish to make sure this is for you before you bid. This Islander 17, Trailer Sailor, At Coniston Boating Centre. 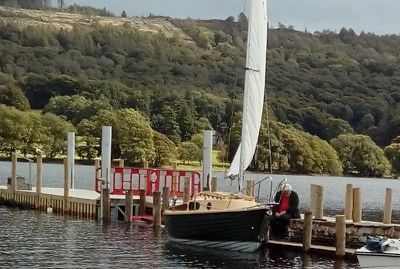 boat is located in Coniston Boating Centre, and is being sold on eBay by skipperowners.